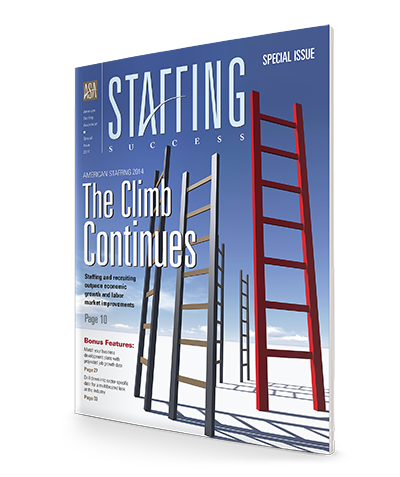 New survey data confirm a powerful truth about the staffing industry: Temporary and contract work is an effective bridge to permanent employment. The U.S. economy has been expanding for more than five years, since the end of the Great Recession. But that expansion has been subpar. It took almost the entire five years to recover the jobs lost during the 18 months of the Great Recession. Although the job losses have been finally regained, population growth has produced more new workers than the economy has created new jobs. The unemployment rate has declined to near normal, but labor force participation has declined to the lowest level in decades. Meanwhile, the staffing and recruiting industry has been growing at a sustained, unprecedented rate—unlike any prior recovery. Why? Is this unique to this particular recovery, because of the Great Recession? Or has a new economic environment emerged that favors the staffing and recruiting industry?